We are recognized as one of the most profound manufacturers, suppliers and exporters of Building Construction Safety Nets. These nets are specially designed for construction industry. Widely used in the construction sites or high storey buildings, these nets are used on construction site for safety purposes of workers. 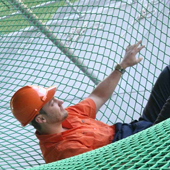 These Building Construction Safety Nets are very durable, flexible and are capable to bear harsh weather condition. Available in various standard sizes and colors, we can also customize these safety nets as per the requirements of our valuable patrons.